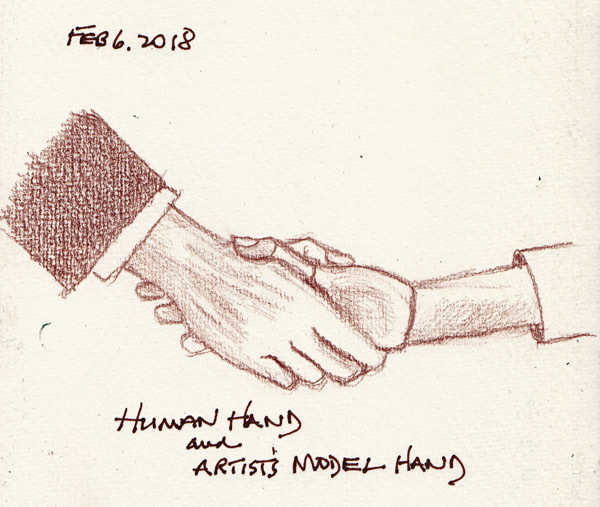 I just finished my 5th Sketchbook of Body Parts - and I know that I still need to practice more. I continue to save magazine advertisements so I can use them for Deliberate Practice. These are the two drawings I did in February. Some months there are more, but this month I've been writing every day. 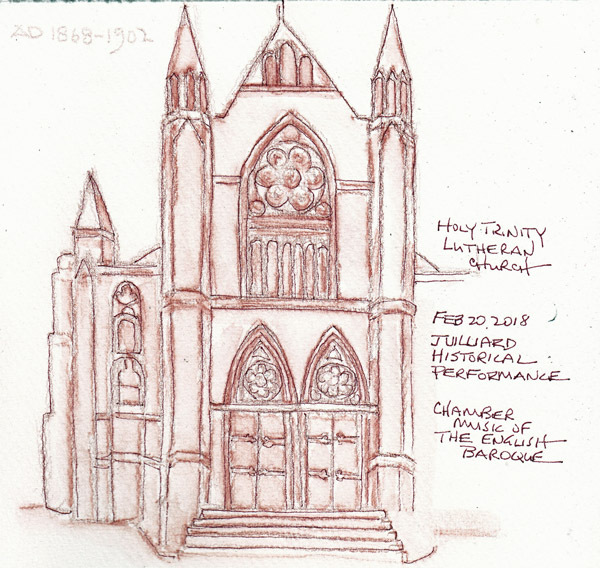 The NYC Weekday Urban Sketchers met at Holy Trinity Lutheran Church for the twice per semester Juilliard Concert of the Historical Performance Graduate Students who play early music. I arrived 15 minutes before the doors opened and made a quick sketch of the building at CPW and W65th St. 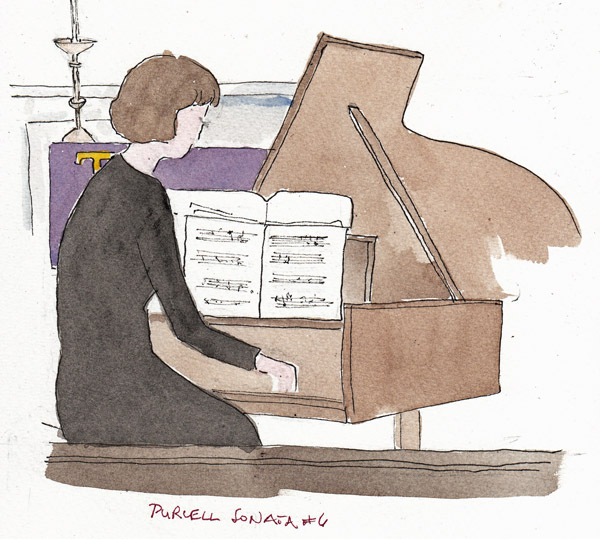 I've previously sketched players and their string instruments at this concert, and wanted to sketch the harpsichord player during the concert. This is a wonderful free concert, and it is first come, first serve seating. 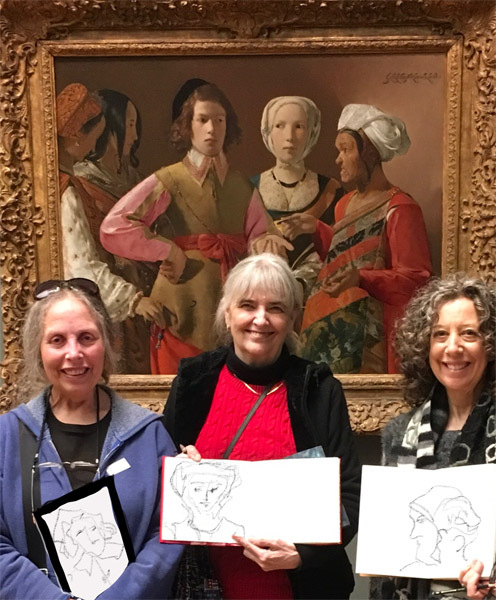 Our group members met after the concert to show their drawings and there were so many different types of drawings, including the 4 big stained glass windows. Joseph Cornell - detail from one of his 12 Boxes inspired by Juan Gris. Not my favorite art, but I wanted to remember working in a series. 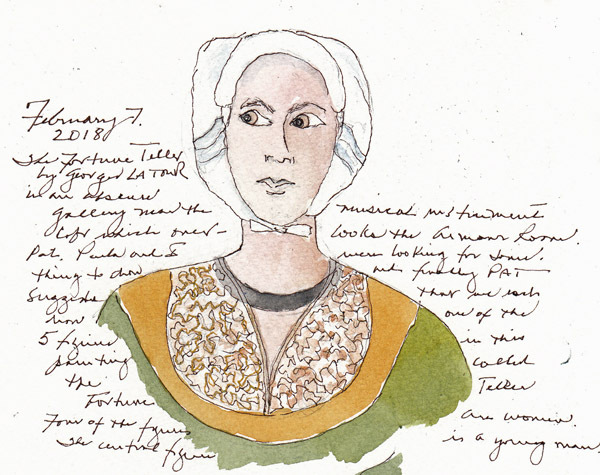 We wandered around trying to find a gallery that inspired all of us, and Pat suggested a random painting by Georges de la Tours, called the Fortune Teller. We all picked one of the figures to draw. Here we are in front of the painting. My sketchbook page is above. On the photo below you can't see the sketches in Paula's or my sketchbook, so Pat just drew them in on her iPAD! We began taking our Grandchildren to the Young People's Concerts 8 years ago. There are 4 concerts per year, and before the 1 hour concert, they have a 30 minute presentation called the Young Composers Concert. Three children from this city-wide music program are selected to have members of the Philharmonic play their short compositions. 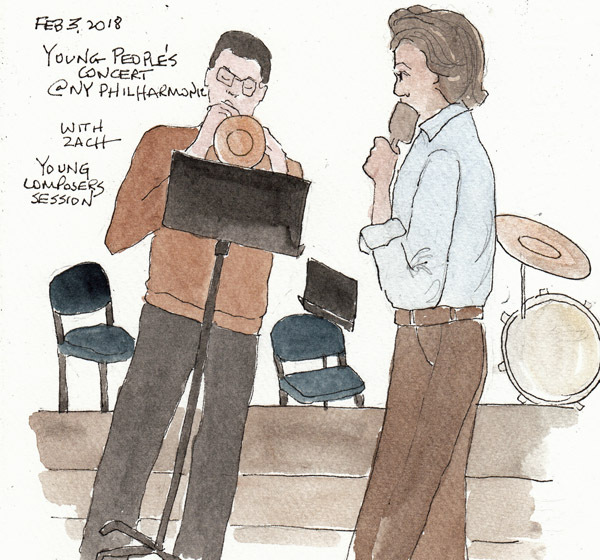 Here is a quick drawing of the head of the program, John Deake, and the trumpet player. 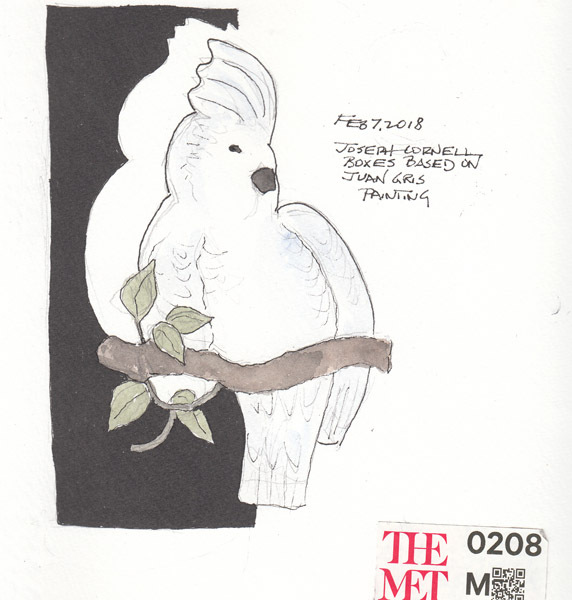 I debate about adding this type of sketchbook page to the Urban Sketchers Facebook Page, but thought this was a good advertisement for an amazing opportunity for kids in our urban city. Giovanni Francesco Barbieri - "IL Guercino"
My daughter had a baby in London in 2006 Several months later we saw a Courtauld Gallery exhibit called "Mind to Paper." I fell in love with this Baroque Italian artist called IL Guercino, the "squinter" because he had a crossed eye. I loved his drawings and to remember Callum's birth, I sketched Guercino's drawing called "Mother and Child" in my London sketchbook. 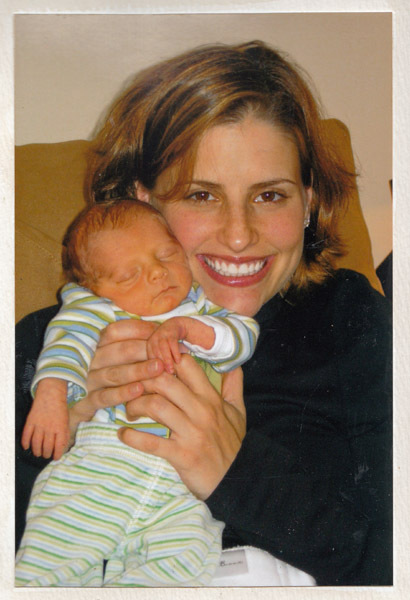 I paired it in my sketchbook with Cal's birth announcement and photo and those pages always make me smile. 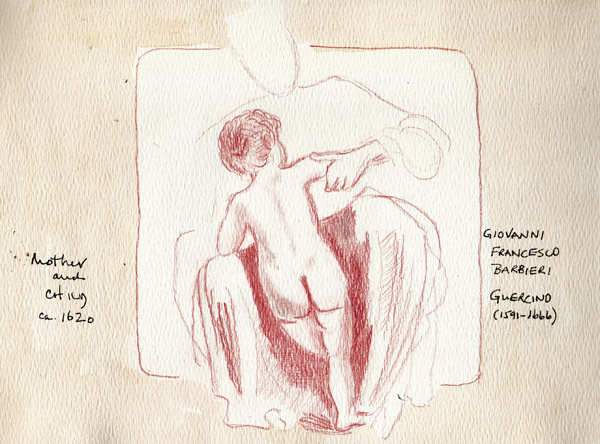 During Master Drawing Week this year I found 6-8 Guercino drawings spread among several exhibits. I copied the drawing at W.M. Brady and Co gallery, which was my favorite. The gallery staff told me that it seems to be preparatory drawing for his painting of "Joseph and Potiphar's wife" at the National Gallery in Washington DC. 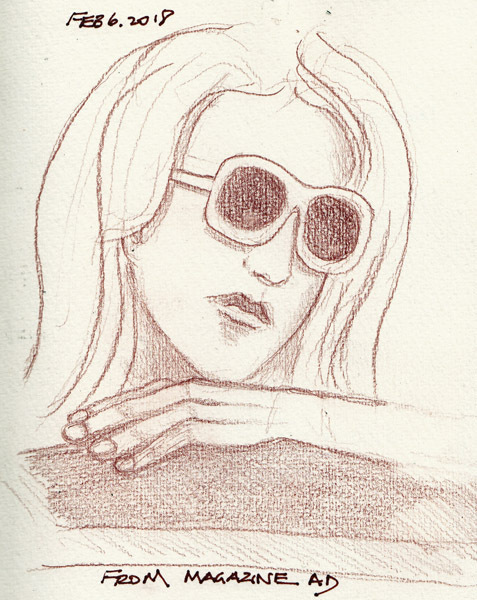 Maybe if I continue to copy his drawings when I see them, I can develop a little of his style.